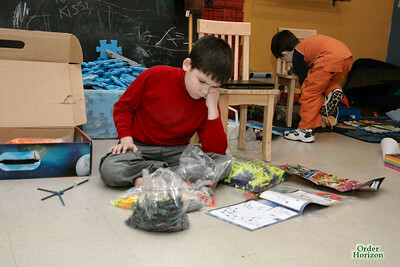 Corwin recieved a number of building toys, such as Lego™ kits. He built most of them within a day or two, even though he didn’t help out with Charles’ Lego™ project. One present, though, provided more of a challenge for Corwin. Here we see Corwin stumped a bit on how to proceed. It got so bad that he was reduced to reading the instructions. It still must have been tough, as Corwin hasn’t finished it yet. He did make some progress, so at least this will keep him busy for more than just Christmas day.